All of Vickie’s hard work, determination and training is paying off in a big way! 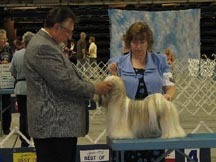 Dante – FFT Kisses of Fire – was awarded Best of Breed both days at the Roaring Forks Kennel Club shows in Eagle, Colorado. Just needing majors, he’s fast approaching a Championship title of his own. Dante, a beautiful dog with lots of attitude and hair, has presented Vickie with several challenges not for the faint of heart, particularly difficult as her first show dog. She has listened, learned and implemented advice and I was delighted last Sunday to be able, with jest, tell her “I told you so! I am very proud of her. I am very proud of Dante. Monday night, at a Lhasa club meeting, Mary Schroeder, former breeder and current judge of Lhasa Apsos, commented that Vickie looks like she’s been showing Apsos for years. A well-deserved compliment! Way to go Vickie! Congrats on your win with Dante! Love the photos, especially the ones of Dante “keeping house”! I will never forget the first time you put him through his paces as just a wee pup at the Denver Cluster–he made everyone smile! Bravo! And Kathy, thanks for the photos of Dante as a pup at the Denver show. He’s still making us smile! His housekeeping isn’t much better, however .